Does just what it’s supposed to! 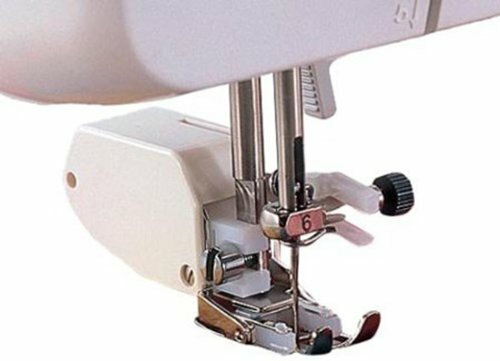 This overlock foot is the next best thing if you do not have a serger to professionally finish your raw edges. I had trouble finishing the edges of my fabric with a zig zag stitch and a regular foot because I could never get the stitch precisely over the edge of the fabric, leading to bunching and wobbly looking stitching. The overlock foot solves all of those problems, however, with it’s handy guide that allows me to get my fabric in exactly the right spot. I’ve used it with several of the built-in overedge stitches on my machine–what a difference! Definitely worth the money for this specialized little foot. Really works! I go back and forth between wanting a serger and being content with just my sewing machine. I took a chance on this presser foot because I could certainly get a lot of fabric for the price of a serger. I’m glad I did because this foot really works! I’m able to create a perfect overlock stitch with minimal effort. I have a Brother XL3750 machine with an included overlock stitch, but the machine has a tendency to pull the fabric to the left so my stitches stretch out from my trying to pull the fabric to the right to keep it on track. This foot has a little piece in the middle where the threads overlay and I think this is what takes the tension off of the fabric in order to keep everything distributed evenly.I may still get a serger someday, but this meets all of my needs for now! It really helps… I am a starter so it was a little difficult to finish the edges of my fabrics. With this SA135 foot, it seems to be more easy to do, as it helps guiding the fabric, keeping a nice uniform edge.